The character first appeared on Chance and Community Chest cards in U.S. editions of Monopoly in 1936. The identity of the designer of the character, artist Dan Fox, was unknown until 2013, when a former Parker Brothers executive, Philip Orbanes, was contacted by one of Fox's grandchildren. Contrary to popular opinion, Rich Uncle Pennybags does not have a monocle and the confusion may come from another advertising icon, Mr. Peanut, who, in fact, does wear a monocle. However, a newspaper article states,"Mr.Monopoly, the games monocled mascot, survives, his top hat one of the few items that remain" alluding to a possible change in appearance by the game company, Hasbro. The unnamed character made his first appearance outside of Monopoly within the Parker Brothers' game Dig, released in 1940, before the U.S. entered World War II. 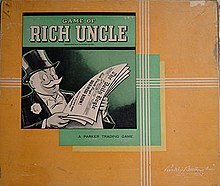 The character did not receive a name until 1946 when the game Rich Uncle was published by Parker Brothers. His likeness appeared on that game's box lid, game instructions, and currency. According to Orbanes, Rich Uncle Pennybags of the American version of the board game Monopoly is modeled after American Progressive Era businessman J. P. Morgan. Between 1985 and 2008, the character appeared in the second "O" in the word Monopoly as part of the game's logo. More recently, the character is depicted over the word "Monopoly", drawn in a 3-D style, and extending his right hand. The character, however, no longer appears uniformly on every Monopoly game box. In 1988, Orbanes published the first edition of his book The Monopoly Companion. In the book, all of the characters that appear on the Monopoly board or within the decks of cards received a name. Uncle Pennybags' full name was given as Milburn Pennybags, the character "In Jail" is named "Jake, the Jailbird", and the police officer on Go to Jail is named "Officer Mallory". In 1999, Rich Uncle Pennybags was renamed Mr. Monopoly. During the same year, a Monopoly Jr. CD-ROM game was released within cereal boxes as part of a General Mills promotion. This game introduced Mr. Monopoly's niece and nephew, Sandy and Andy. According to the book, Monopoly: The World's Most Famous Game & How It Got That Way and The Monopoly Companion, Mr. Monopoly has a second nephew named Randy, although the Monopoly Companion mistakenly refers to Sandy as a boy. Monopoly: The World's Most Famous Game & How It Got That Way also states that Mr. Monopoly has a wife named Madge. He is named as the sixth richest fictional character in the 2006 Forbes Fictional 15 list on its website and the ninth richest in 2011. In 2017, a staff member of the activist group Public Citizen dressed as Mr. Monopoly (with added monocle) gained Internet and media attention by photobombing the CEO of Equifax during a US Senate hearing relating to that credit bureau's data security breach from earlier that same year. It was an attempt to bring attention to the use of "forced arbitration" to circumvent consumers' rights to sue financial companies in court. While Google CEO Sundar Pichai testified before Congress on December 11, 2018, a person costumed in a white mustache and black bowler hat as the Monopoly Man was among those seated behind him. ^ a b Lauren Feiner (December 11, 2018). "A person dressed up like the guy from Monopoly sat behind Google's CEO as he testified before Congress". CNBC. Retrieved December 12, 2018. Ian Madrigal, the person who identified themselves as the Monopoly Man, said the act is a protest of the internet company's alleged inability to self-regulate when it comes to protecting consumer data. ^ Engle, Rebecca (2017-02-15). "Mandela Effect Conspiracy Explained". The WP Wire. Retrieved 2018-12-12. ^ Hasbro Toy Shop page for Monopoly. The mascot character appears only on the Standard Edition set. ^ USAopoly page for Monopoly. The mascot character appears on only about half of the editions shown. ^ a b Orbanes, Philip (September 1999). The Monopoly Companion: The Player's Guide : The Game from A to Z, Winning Tips, Trivia. Adams Media Corporation. p. [page needed]. ISBN 978-1-58062-175-5. Retrieved 2009-06-26. ^ Vanderkam, Laura (March 21, 2007). "Just Visiting". American.com. Retrieved 2009-06-26. ^ "The Forbes Fictional 15 - #6 Mr. Monopoly". Forbes. 2006-11-20. Archived from the original on 2012-09-16. Retrieved 2009-06-26. ^ "We Spoke To the 'Monopoly Man' Who Photobombed the Senate Equifax Hearing". 2017-10-04. Retrieved 2017-12-29. ^ Chiel, Ethan (2017-10-04). "A Chat with the Viral "Monopoly Man" Who Trolled the Equifax Senate Hearing". GQ. Retrieved 2017-10-04. ^ Romo, Vanessa (2017-10-06). "How Monopoly Man Won the Internet". GQ. Retrieved 2017-10-06. Orbanes, Philip E. (2006). Monopoly: The World's Most Famous Game & How it Got that Way. Da Capo Press. ISBN 0-306-81489-7. Orbanes, Philip E. (2004). The Game Makers: The Story of Parker Brothers (First ed.). Harvard Business School Press. ISBN 1-59139-269-1. Orbanes, Philip (1988). The Monopoly Companion (First ed.). Bob Adams, Inc. ISBN 1-55850-950-X. "Do not pass Go. Do not collect $200." This page was last edited on 27 March 2019, at 15:51 (UTC).